What's New at Steamy Attic Records? 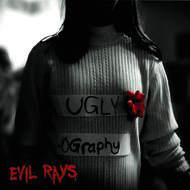 Uglyography's fourth album, Evil Rays was released in January 2017 and won the Veer Magazine local music award for best experimental . With four different drummers and more genre hopping quirkadelic bliss, this one will take you ... places. Yes! 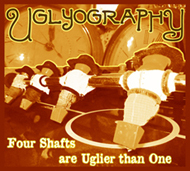 UGLYOGRAPHY RELEASES NEW ALBUM JANUARY 26, 2013! ASTHMATICS RELEASE DEBUT ALBUM, RECORDED AT STEAMY ATTIC! 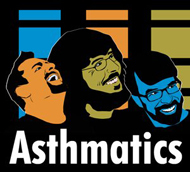 The newest release coming out of Steamy Attic Records is from the Newport News band Asthmatics. The debut 13 song (plus one bonus song if you are lucky) was recorded and mixed at Steamy Attic from Sept 2011 - April 2012. We are all very pleased with the results. Listen, and buy digitally at Bandcamp right here! UGLYOGRAPHY RELEASES SOPHOMORE ALBUM, UNDERCOVER NEW MACHINE. The album now released and Matt is super stoked for everyone to hear it. The album is 13 songs and clocks in at just under 50 minutes. As opposed to Love Boat (Uglyography's debut album), this album uses REAL drums and was tracked in the new and vastly improved project studio. It was mastered by John Golden of Jawbreaker and Primus fame, and the album artwork was crafted by the UK artist/toy designer, Doktor A. Order your copy here. MOVING GIANTS RELEASES DEBUT EP. Matt's old buddy Scott Minter brought his band, Moving Giants, in to the Steamy Attic in Spring 2010 to have Matt record and mix their first EP, It's All Silly, Really. You can currently stream their songs from from their myspace page at www.myspace.com/movinggiants. Scott, Adam, and Tim of Moving Giants have now added two other members and formed the new band, Popular Vultures. The band will be opening for Uglyography at the CD Release Party on Feb. 19 2011 at The American Theatre in Hampton, VA.
LORD BOWLER CURRENTLY RECORDING SECOND EP. Although the band halted their performances last year when Mike L. moved to Raleigh NC, the band is currently recording a second set of 6 songs. You may have heard them performed during their 2010 run of shows. More info to come soon. Check out other Lord Bowler stuff at www.lordbowler.com.